Oh hey guys! I made a shocking discovery. Whilst listening through my recently downloaded Vocaloid albums, I came across this one called "Revolution Boi VS Agent Smith". It turned out to be a mixture of remixes of K-Pop and Vocaloid. I was surprised yet impressed that such thing existed. I wasn't paying attention to what I was listening to because you know, 103GB worth of music obviously needs to be on repeat. Suddenly, I heard the tune 'Hoot' (SNSD) play in a remixed version. I was like 'What the - '? Then I looked at the album then Googled the name, then I was like 'Oh!'. And so, this ends my shocking discovery of a mashed compilation of remixed songs of Vocaloid and K-Pop. I must say, its a pretty good album. If you are into Vocaloid and K-Pop then this album you must definitely get. This anime may seem cute and 'moe' at first, but it definitely far from it. Even though the characters lack fierceness, the drama, action, hatred, revenge, love and suffering seen throughout this anime really makes up for a psychological thriller anime. Beloved family, good friends, laughter and tears - these things make up the ordinary life of Kaname Madoka, a second year student of Mitakihara City Middle School. One night, Madoka dreams of a mysterious dark haired girl struggling against a terrible evil; the next morning she discovers that the girl, Akemi Homura, has transferred into her class. 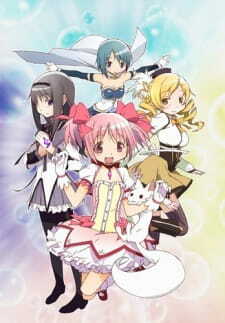 This encounter will lead to an incident which will alter Madoka's fate forever. This anime controversial in many ways. Let me begin with its context and theme. This is is definitely not a cute anime and it shouldn't be considered one. The portrayal of the characters and art style maybe contradicting to a dark anime, but after you start watching and find out more about the background and story, you will agree that this anime has a darker meaning behind it. The anime has a mixture of many dramatic themes such as love, hate and betrayal. Thus, it brings out many emotions at mixed levels. You will definitely feel that the story was well described and concluded. I cannot say much here as not to spoil the affect that this anime has on the audience. The art style can be said as contradictory to one another. The cute portrayal of the characters and the dark, evil settings are evidently clashed together in many mixed scenes. Once you get over the fact that the characters are 'moe' you will definitely see the darker side eventually. The use of dark undertones and bright colours clashing with each other really brings out the unique art style of this anime that not many other anime have successfully accomplished. The theme songs were catchy enough and the voice acting was perfect as usual. Not much to expect spectacularly from here, although the sound effects were well used. The change in environments and the dramatic background music really set the feeling and mood right for the anime. The characters were all cute and 'moe'-until you watched on. They may seem nice and cute at the start, but as you will discover, not all characters are what they seem. There are shocking discoveries and surprising moments that will leave you asking - why? You will really feel for the character as they interact with each other due to love, hate and ambition. This anime really portrayed the characters completely in a different sense of style. Overall, all I can say that I really enjoyed this anime. There are not much anime quite like this since there is pretty much a lack of interest in such themes. The last anime that was distinctly similar to this one was decent enough but did not make the top list. However, this anime has suprised many people at how good it is. In the end, I wish there will be a second season as I still have many questions left unanswered. I know that this won't happen because of how the story ended. You will have to watch it completely to find out. A bit confusing at the start, but details are slowly revealed in a linear direction. You will come to understand more and more as you watch. What can I say? It shows cute girls in cute uniforms and twinkly atmospheres. Right! To an extent. Good voice acting and catchy theme songs. Good use of intense background music in appropriate moments. I loved the characters and how different they were with one another. Each had its own unique colour and ability. Loved the story and the drama. Even though some questions remained, the story was well told and if necessary explained well in detail. Its an intense and cute anime with dark themes. You may think its innocent but I say, its far from it.